An easy weeknight dish that uses chicken thighs, fresh herbs and a quick pan sauce to get dinner on the table in a hurry. 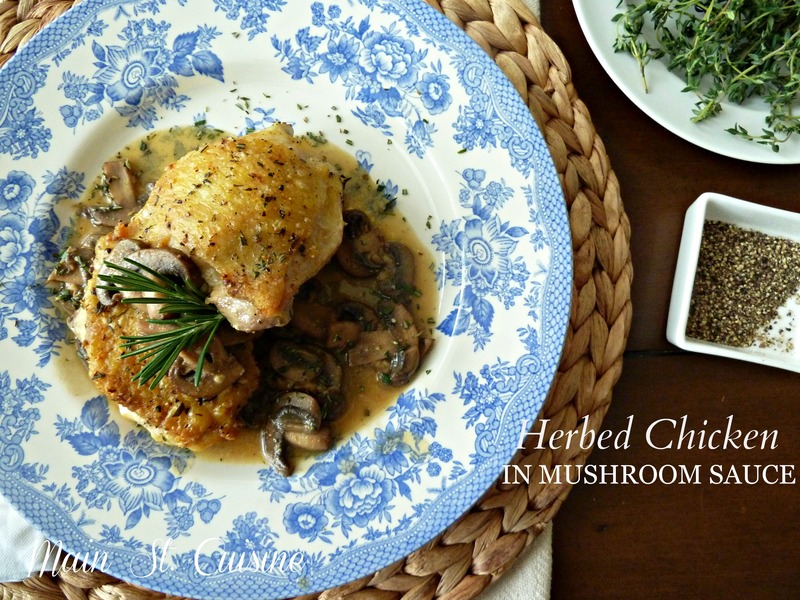 I’m continuing with my Mondays on Main St. series with this delicious recipe for herbed chicken in mushroom sauce. Have you missed a recipe in the series? No problem, you can click right here and find every single one. In looking at the calendar, we’ve got another jam-packed week as I’m sure you do as well. Lots of baseball (practices, a scrimmage, middle school games and two travel tournaments). Did I mention house guests? We’ve got family arriving in three days. For some strange reason, the more I have on my calendar the more I get done. It’s frenzied and a little crazy but somehow I’m more efficient. Looking ahead, I’m going to begin posting weekly menus here. It’s something that I’ve wanted to do for awhile, but just haven’t gotten in the swing of posting them regularly. Even I get stuck on deciding what we should eat each night, especially if we don’t walk in the door until after 6:00 p.m.
Look for that next week. I hope it will be helpful for you too! One of the great little tricks of this recipe is getting the skin of the chicken thighs nice and crispy in the skillet and then finishing them in the oven. You’ll need 8 bone-in, skin-on chicken thighs. 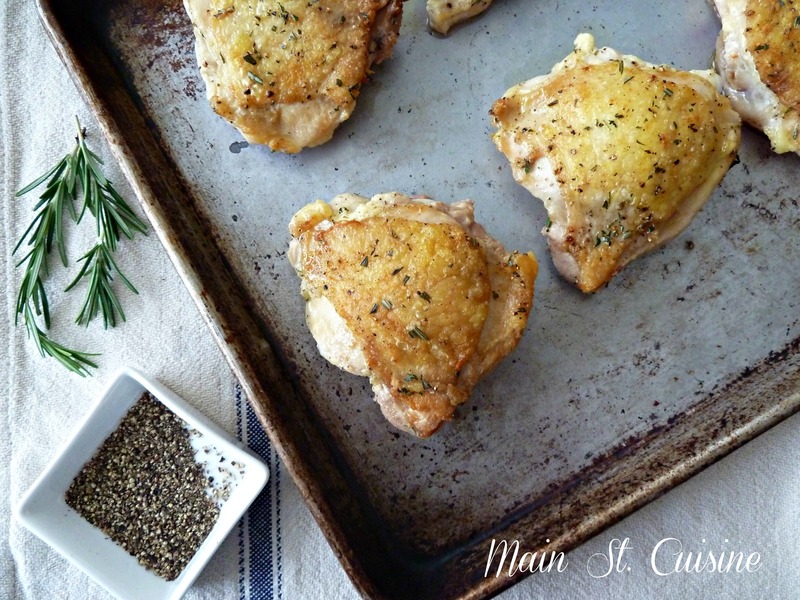 I used 1 ½ tbsp each of minced fresh rosemary and minced fresh thyme (divided) along with kosher salt and freshly ground black pepper to season the thighs and give them that great, fresh herb flavor. Here are the chicken thighs after they came out of the oven. For kids who are not find of a pan sauce made with mushrooms, you could skip the next steps and just stop here. Pretty easy, right? I plated each serving by dividing the sauce onto each plate and then adding two chicken thighs, a light sprinkling of the remaining minced herbs and then a couple of sprigs of fresh rosemary. Here’s a final look at the plated chicken in mushroom sauce. If you’re wondering if my children ate this, you should know they enjoyed the chicken but skipped the sauce and the fresh herbs. One day, those fresh herbs will actually remain on their dinner plates. Maybe. Preheat oven to 400°. 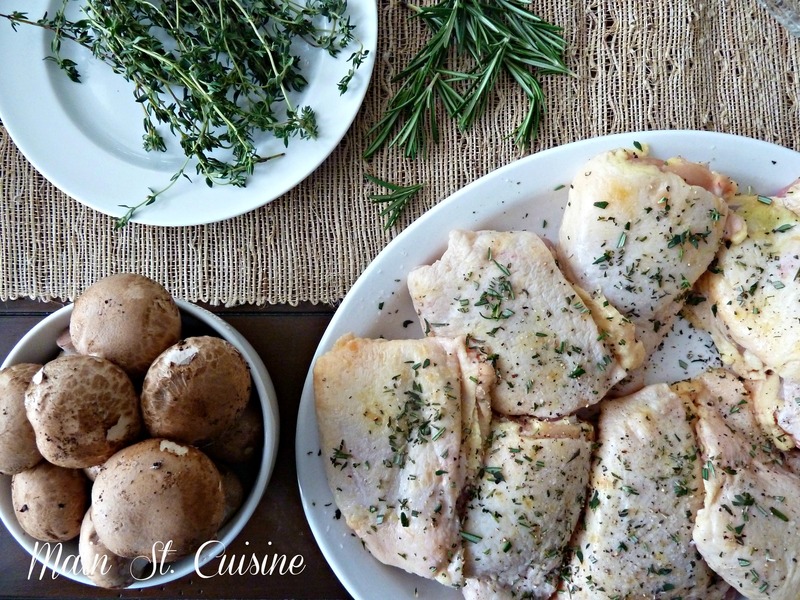 Season the chicken thighs on both sides with salt and black pepper and 1 tbsp each of the minced, fresh herbs. In a 12-inch skillet, over medium-high heat add olive oil. When the oil is hot, add the chicken thighs skin-side down. Working in batches, cook for 5 minutes or until the skin is browned. Remove the chicken thighs to a baking sheet, skin-side up. When all of the chicken thighs have been browned, place the baking sheet into the oven to finish cooking for 15 minutes or until a meat thermometer inserted into the chicken reaches between 165-175° (temperature for cooked chicken thighs). Using the same skillet, pour off all of the fat leaving 1 tbsp. Over medium-high heat cook the sliced mushrooms 5 minutes until they are cooked down. Sprinkle them with flour and then add the wine. Turn up the heat, cooking and stirring for 2 minutes. Whisk in the chicken broth and mustard lowering the heat so that the sauce is brought to a simmer. Remove the skillet from the heat. 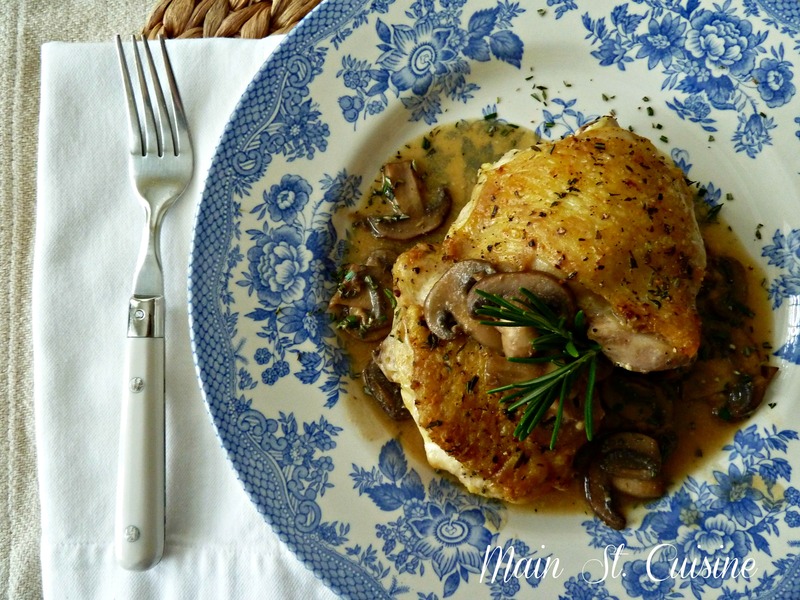 To plate each serving, divide the mushroom sauce among 4 plates and place 2 chicken thighs on top of the sauce. Sprinkle with remaining rosemary and thyme. Garnish with additional sprigs of fresh herbs, if desired. I am ‘so all over this’ recipe!! Of course I’m going to ‘pin it’ but I’m also printing it immediately. I’ve become a big fan of chicken thighs – and this looks so delicious. Great photos by the way!!! Thank you so much for that, Cecile! 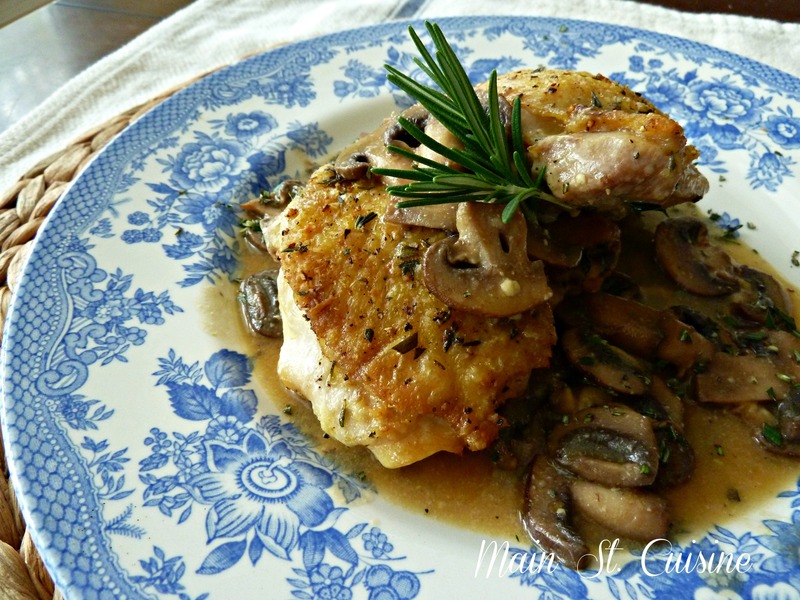 I love the addition of a pan sauce over the chicken thighs. Of course, it’s perfect to dip some good bread into too! Thanks again for your kind words! 🙂 Hope you’re having some pretty spring weather up your way this week. A perfect and comforting meal. My husband would ask where the mashed potatoes are though. Thanks for the lovely recipe Allison. Ha! My husband would probably ask the same!